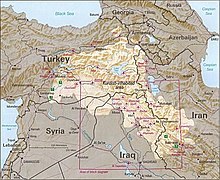 ↑ "Kurdistan - Definitions from Dictionary.com". Retrieved 2007-10-21. ↑ "Kurdish Studies Program". Florida State University. Retrieved 2007-03-17. ↑ "Kurdistan". Encyclopaedia Britannica Online. Retrieved 2010-07-29. ↑ N. Maxoudian, Early Armenia as an Empire: The Career of Tigranes III, 95–55 BC, Journal of The Royal Central Asian Society, Vol. 39, Issue 2, April 1952, pp. 156–163. ↑ The Columbia Encyclopedia, Sixth Edition, 2005.